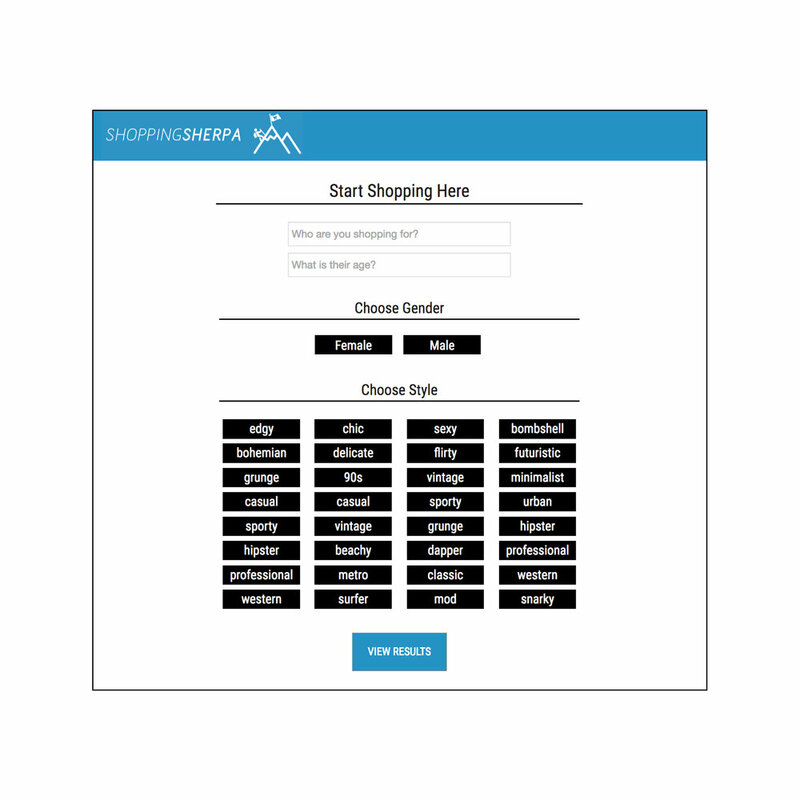 ShoppingSherpa is a web application that offers users an opportunity to find new places to shop or to shop for others. How do customers find new places to shop online? If they try a Google search, they are faced with choosing between thousands of search results that might not even send them to a store that fits their style or the person for whom they are shopping. This turns what should be fun into a logistical nightmare. For online shops, there has never been more pressure to maintain an online and IRL experience for customers. In 2016, online shopping surpassed in real life shopping for the first time. Retail e-commerce sales worldwide are forecast to nearly double between 2016 and 2020, and digital interactions influence 36 cents of every dollar spent in retail stores (~$1.1 trillion). So how can potential customers and online stores become more easily connected? ShoppingSherpa offers users an opportunity to select their gender, age, and styles in order to find new places to shop or to shop for others. After choosing their search criteria, they receive a customized list of stores that fit their personal style. This curated experience allows users to find new stores and fulfill their needs more easily. Phase 2 will introduce a local component that allows users to find online shopping options with brick and mortars within their area, so they can purchase items online and pick them up in the retail store. ShoppingSherpa uses three criteria—age, gender, and style—to find the perfect online shop for users. Once the user inputs their search criteria, the application will deliver results of online stores that fit their selection. They can click directly through to the online shopping website from the web application.